If your kids are too young for the mature content in the Grand Theft Auto series, now there's a great alternative: LEGO City Undercover (for Wii U). It's taken a similarly vast, urban world full of vehicles to drive and characters to interact with and made it kid friendly. They’ve substituted Grand Theft Auto’s dark, criminal themes with the trademark cheeky humor and clever game play of the LEGO line of games. The results? Excellent. 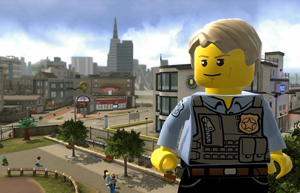 LEGO City Undercover features a plucky police officer named Chase McCain tasked with capturing the town's toughest crooks. To achieve his objectives, Chase must don a variety of disguises. He’ll also enter high speed car chases through busy streets, go on puzzle-centric missions and get into the occasional fisticuffs. However, there’s absolutely no blood or death, you can fight and shoot LEGO guns that stun or colorize opponents. You can also run over other LEGO figures in your vehicle, which can initially be a bit startling,. All characters quickly get back up and resume play, and the hero’s goal is simply to catch and handcuff the bad guys. The Wii U gamepad is used intelligently as a map viewer, communication device, scanner, camera and bugging device to listen in on criminal chatter. Kids can just freely explore the city, which can also be rewarding; random searching can unearth special bricks, unlockable mini-figure characters, and massive building projects. From skateboards to boats and cars to motorcycles and even a helicopter, there are tons of cool vehicles to jump into. Gamers looking to unlock every bit from the adventure can find over 50 hours of playtime. The only real drawback is that there is no multi-player. The lack of a cooperative mode might disappoint some used to joining up with a buddy on the couch that many LEGO games offer. 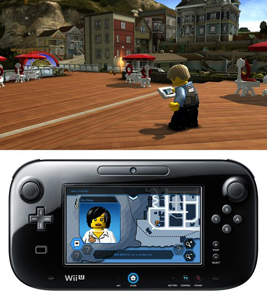 Still LEGO City Undercover is still a brilliant game and may be reason enough for Lego fanatics to pick up Nintendo's new Wii U console. LEGO City Undercover is available on Amazon for $49.99.